Even FBI agents are having trouble solving the mystery surrounding a narrow tunnel that was burrowed underground toward a bank in Pembroke Pines. NBC 6's Erika Glover reports. A tunnel leading toward a bank from a wooded area was discovered in Pembroke Pines, Florida, Wednesday and the FBI is investigating. A public works crew responded to what appeared to be a sinkhole on a side street in the area of Flamingo Road and Pines Boulevard near a Chase bank, FBI Special Agent Michael Leverock told reporters. When they looked into the hole, they noticed a power cord running into nearby woods. Leverock said police and FBI agents responded and found the entrance to a tunnel about 50 yards long leading right up to the bank. A winch, a wagon, a small generator and other items were found near the hole. "We don't know who is behind this at this time, they could have been here a week ago, last night, we don't know at this time but it is an extensive hole," Leverock said. "Usually you use equipment to do that, these people were using pickaxes and a small little wagon...this is truly a unique case here." Leverock estimated that the hole was about a foot or two below ground and between two and three feet in diameter, calling it "very claustrophobic." The opening to a tunnel FBI officials say was dug underground leading to a Chase bank in Pembroke Pines. "I would like to say I saw something like this in movies however this hole is so small, it's unique," he said. "I don't know how they did it, I would like to put it into words for you, but it is so cramped in there." 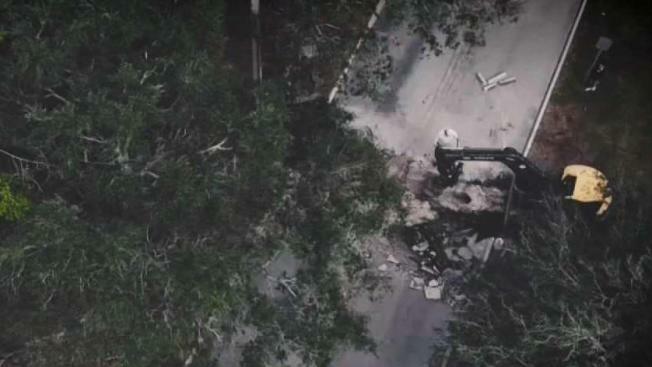 A Palm Beach County Sheriff's Office cadaver dog was also sent into the hole to make sure no one was inside, but no one was found. Leverock said recent heavy rain may have contributed to the collapse of the tunnel, and said whoever made it didn't get into the bank, calling it an attempted burglary. "It's a puzzle, I can't imagine how they did it," he said. The FBI released photos showing a tunnel that goes from a wooded area, under a street and right to a Chase bank.